When Russian President Vladimir Putin touched down in Vienna with a 30-minute delay on Tuesday, the military guard of honor stood ready, waiting in the blistering heat in the courtyard of Vienna’s imperial palace. The red carpet was rolled out, framed with enormous Russian and Austrian flags and little box trees neatly lining the way. After being greeted at the airport by Austrian Foreign Minister Karin Kneissl and former Ambassador to Russia Margot Klestil-Löffler, the Russian leader finally arrived at Vienna’s Hofburg. The military parade played the national anthems and the Russian and Austrian presidents walked along the carpet together and then up the stairs to the President’s office. The moment President Putin entered the room, he was greeted by a frenzy of flashing cameras. Both Presidents posed beneath the large portrait of Habsburg Empress Maria-Theresia. A couple of journalists smiled wryly: usually President Putin never keeps a monarch waiting! Indeed, the only times Putin has ever been on time were for meetings with Britain’s Queen Elizabeth and King Juan Carlos of Spain. All said, though Putin likes to come to Austria – and not just because of his fondness of the alps. It’s also because of a special relationship between the two countries that dates back to the immediate post-World War II period. In 1955, the Soviets agreed to withdraw their troops from Austria on the condition that it would become a neutral country, not joining any military alliance in the West. Austrian neutrality was a precondition for its sovereignty restored in the 1955 State Treaty. In the decades that followed, Austria developed an active policy of neutrality under Chancellor Bruno Kreisky, who made Vienna a neutral place for East-West dialogue during the Cold War and a hub for international organizations, such as the UN and the OSCE. 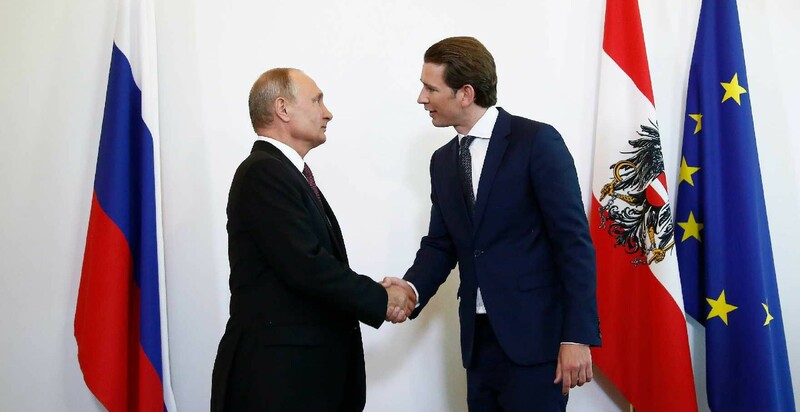 Today’s Chancellor Sebastian Kurz sees himself and Austria in that same tradition and has suggested on numerous occasions to act as “bridge builder” between Russia and the West. It therefore came as little surprise that Putin chose Austria as his first official working visit abroad since being re-elected Russian President March 18th. He could be sure of receiving a warm welcome in Vienna – in stark contrast to the tough exchange with ORF news anchorman Armin Wolf, conducted with the Russian President on June 5. The visit officially marked the 50th anniversary of the signing of a natural gas deal between Austria and the Soviet Union in 1968. Executives of the Austrian and Russian oil and gas companies OMV and Gazprom took the opportunity to sign a new cooperation agreement during a press conference to prolong Russian gas deliveries to Austria until 2040. This was no small thing and Gazprom CEO Alexey Miller and OMV Director Rainer Seele hugged like best friends amid a flurry of camera flashes. While the official topics under discussion where economic, much of the visit was dominated by politics, and Putin was generally given an easy ride. On eastern Ukraine, Austrian Chancellor Sebastian Kurz expressed hope for a diplomatic solution and the implementation of the Minsk Agreements, while supporting a “step by step” easing of sanctions. “It is only together and not against each other that we can make progress,” he said. He also pleased Putin by referring to Russia as a “superpower” that has responsibilities to help end international conflicts. This stood in stark contrast to previous statements by former US-President Barack Obama who famously offended Putin by labelling Russia a “regional power”. Putin’s self-confidence was further stroked during a joint press conference with Austrian President Alexander Van der Bellen. Asked whether Russia had a “credibility problem”, Austrian Van der Bellen rejected this, describing the situation as “business as usual”. “There is no fundamental crisis of trust with Russia,” he said. So the hard political realities were ignored as Putin was courted and flattered by his Austrian hosts. Russia’s illegal annexation of the Crimean Peninsula in 2014, Russian support of rebels in eastern Ukraine, the downing of flight MH17, support of President Assad in Syria, election meddling and the Skripal poisoning were all set aside on that day in Vienna. Instead, Putin seemed particularly pleased to talk about the excellent economic relations between the two countries. Indeed, Austria has investments worth 4 billion EUR in Russia, while Russian investments in Austria run to about 24 billion EUR. Also, trade between the two countries increased in 40% in 2017 despite the sanctions regime. Consequently, the meeting between business executives and the Russian President was more than amicable to say the least. The hall at the Austrian chamber of commerce was filled with at least 350 people, who all jumped out of their seats when the Russian President arrived and held up their mobile phones to take a picture of the Russian leader. In his speech to business executives, Putin praised Austria as a “reliable economic partner” even during difficult times, referring to the new agreement between OMV and Gazprom and Austria’s important role as a “hub for gas delivery in Europe”. “Our economic relationship is very good, but it can get even better – but this depends on you,” Putin concluded in perfect German, a reflection of his years as a KGB agent in the former East Germany (GDR). But in the current era, Austria’s attempt to act as an intermediary between East and West is a difficult balancing act. Rumors about a possible Summit between Trump and Putin in Vienna are a sign that Austria indeed wants to take on this role. This would not be the first time that US and Russian leaders are meeting in Vienna. There is a precedent: Former Chancellor Bruno Kreisky hosted U.S. President John F. Kennedy and Soviet Premier Nikita Khrushchev in Vienna in 1961. While Austria’s attempt to foster dialogue between Russia and the West is a much-needed initiative, for Austria as EU member, striking the right tone will also be important. The Cold War is over: Austria is a member of the EU and therefore has an obligation to act in solidarity with its European partners. Vienna’s behaviour is watched even more closely now that the country will assume the EU-Presidency on 1 July. The overwhelming focus on charming and courting Putin in Vienna sends, for better or for worse, the opposite signal. Glossing over a long list of aggressions and breaches of trust, it was just what Putin needed to project the image of a Russia that is not isolated, but with the retreat of the United States, seen increasingly as a reliable partner on the international stage.